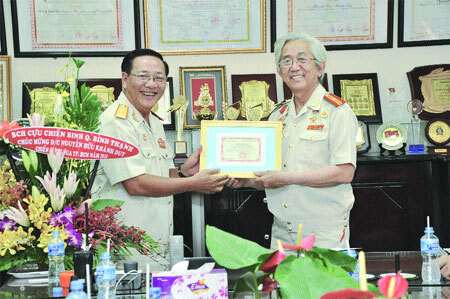 Just reward: Dr Nguyen Huu Khanh Duy receives an award from the Veterans Association of Binh Thanh District for his contributions to society. — Photo courtesy of Dr Nguyen Huu Khanh Duy. Exposed to the problem during his stint as a juror, a physician and former intelligence agent has dedicated his life to helping drug addicts rehabilitate themselves, Xuan Hiep reports. Viet Nam's reunification 40 years ago came as a result of the sacrifice of millions of Vietnamese, including intelligence agents who made invaluable contributions to the war against the Americans. Besides the well-known names of Tran Quoc Huong, Vu Ngoc Nha and Pham Xuan An, the spy group A10 played a critical role during the war, as did many other anonymous secret agents. On the occasion of Liberation Day, April 30, I had the pleasure of meeting Dr Nguyen Huu Khanh Duy, 68, who was the former deputy chief of Group A10 led by Tran Quoc Huong, commander of the liberationarmy's secret agent network operating in South Viet Nam. 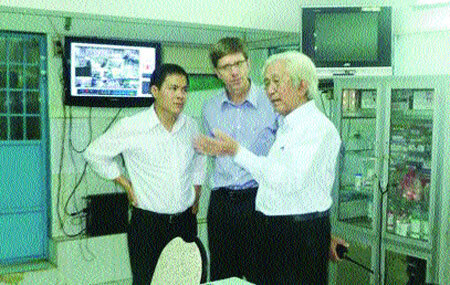 He is now the director of the Thanh Da Drug Rehabilitation Centre. We met on a busy weekday morning at the centre where he still works day and night to rehabilitate serious drug addicts. I was immediately impressed with his simple and friendly manner. The grey-haired man, dressed in a light blue shirt and dark trousers, welcomed me as if we had met before. As he shook my hand firmly, I noticed that he appeared to be in robust health. As he told me about his early days, he spoke softly and quietly, but his tone was deep and warm. Born in the central province of Nghe An to a Confucian family, Duy grew up there, attending the Phan Chu Trinh School in Da Nang where he was an excellent student. His family, he said, took part in a Buddhist organisation when he was still in primary school. Later, as a student in high school and university, he began to learn more about the patriotic movement and the war. Fierce fighting took place in the central region, and it was then that his revolutionary spirit was awakened. From the early 1960s, he began to take part in the urban movements against the US and the US-backed regime of Ngo Dinh Diem, and other governments of the Sai Gon regime. In 1966, Duy studied at the Sai Gon University of Medicine, and from there, he took a more active role in the revolutionary movement. In 1971, he joined the Armed Security Force, later becoming the deputy leader of Group A10. Still watchful: Though Dr Nguyen Huu Khanh Duy is nearing 70, he still exudes dynamism and enthusiasm, and a passion for his work to help people with serious drug addictions. Besides collecting information about the plans and Sai Gon administration and their army, Group A10 also carried out strategic targets by deploying political attacks and dividing the enemy forces. He set up a network targeting the forces of Duong Van Minh, who was the last president of the Sai Gon administration. The technical director of Dien Tin newspaper, Huynh Ba Thanh, the mouthpiece of General Duong Van Minh, of the Sai Gon army, supported Duy by directing public opinion in favour of the revolution and condemning the enemy's ideology in the paper, and most importantly, putting pressure on the Nguyen Van Thieu's government. Thieu ultimately resigned and fled the country, and Duong Van Minh surrendered on April 30, 1975, signaling the end of the war. 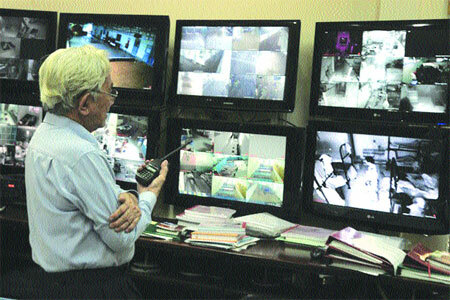 Duy then began working as a major for the Counter-Intelligence Command of the People's Security Force in HCM City, using his skills that he had honed as a spy. In 1990, he moved to the city's Health Service to pursue his medical career. While working there, he also acted as a juror between 1995 and 1999 at the municipal high court. It was during this time that he began to be more exposed to the problem of drug addiction as many of the court cases involved recreational drug abuse. Though Duy retired in 2000, the former revolutionary, with the heart of a soldier, has had little rest since that time. He told me that his regular interactions with drug addicts during his medical practice and his time as a juror had shown him how terrible the impact of addiction could be on their lives. With this in mind, he asked his friends and colleagues, who were members of the Veteran Association of Binh Thanh District, to help him found the Thanh Da Drug Rehabilitation Centre in HCM City in 2000. "The centre was the collective achievement of veterans who had returned from long years of fighting," he said. "Their desire was to use the remaining years of their lives for a noble purpose, and to help improve the lives of those addicts." It was abundantly clear that he still exuded dynamism and enthusiasm, with a passion for his line of work. In Viet Nam, heroin abuse has been a troubling issue for years, and "ice", a powerful methamphetamine, is emerging as a popular drug. "One of the emerging issues of social concern today is drug addiction and HIV and AIDS," he said. "That's why we thought we should rush to this front. For the former soldiers with difficult problems, we must solve this and give it priority." The centre, covering more than 8,000 sq.m, is located near the Sai Gon River in Binh Thanh District. After 15 years of operation, it has carried out more than 12,000 treatments for drug addicts. 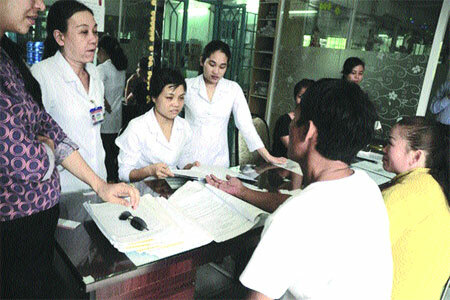 To help addicts get back on track, Duy has written thousands of pages of documents on rehabilitation theories and methods at a local and national level. He attributes the success of the centre to its combination of rehabilitation methods and promotion of public awareness about drug addiction. The centre provides treatment for 1,000 addicts every year. The patients receive individualised treatments tailored to their health situation. An addict at the centre, who asked to remain anonymous, said: "I've received good care and treatment from the centre. I'm trying my best to cure my addiction so I can return home and start a new life soon." Duy remains close to the patients, talking with them and sharing their feelings and concerns about the difficulties that they must overcome. "Doing rehabilitation work without a kind heart is considered a failure," Duy said. For him, the greatest happiness is to receive telephone calls from drug addicts who have been rehabilitated and are integrated into regular life. To prevent relapses, the centre has set up a Relapse Prevention Department to treat patients with naltrexone (a medicine that curbs the craving for drugs). It combines this with counseling skills, psychological therapy, educational therapy, social therapy, and individual, group and family activities, among others. Each rehabilitation centre has its own model, but the specialty of the centre where Duy works is its focus on education, adaptation and public awareness, behavioural and personality rehabilitation and consultation, and psychological therapy. With their contributions to society, Duy and the centre's staff have received many awards from the Government. The physician, who has two sons, said he had little time for sports or hobbies, spending hours every night researching new rehabilitation methods and ways to fight drug abuse. He also continues to participate in local and international seminars on related issues to find the best ways to cure drug addiction. As I prepared to leave his office, Duy told me that his aim as an intelligence agent during the Anti-American War was to help people, and that the centre's rehabilitation efforts were also being done for people.